The profession of arms and the fraternity of Freemasonry have long marched together. The British military has throughout its years had Masonic Lodges attached to several of its regiments. Jessica Harland-Jacobs chronicles the history of Freemasonry in the British Empire in her book Builders of Empire, illustrating how Irish military lodges spread the influence of Freemasonry across the Empire. [i] The idea of Manifest Destiny in the United States also helped with the spread of Freemasonry. One can find evidence of Freemasons stationed at the various frontier posts, such as Fort Larned, Kansas; where soldiers with time on their hands carved their names and the square and compasses into the soft stone that comprised the fort’s buildings. Oklahoma is no exception when it comes to military activity and the advance of Freemasonry. 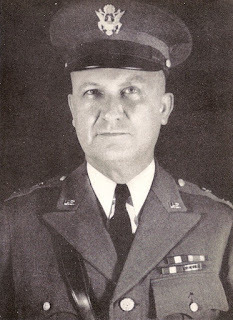 Several Masonic leaders in Oklahoma have had noteworthy military careers, one of those being Major General William Shaffer Key. Upon learning of the passing of Key, his wife received the following message from the President. Word reached me recently of the death, early this month of General Key. He was a fine soldier and citizen, and served his country with devotion and courage. I was fortunate to count him among my friends. Mrs. Eisenhower joins me in deepest sympathy to you. General William Shaffer Key embodied all that defined the American citizen soldier. He once remarked “The greatest thing in life is friends. They comprise the greatest wealth a person may have…”[xxi] Key was widely respected in the many facets of his life and many would be well served to emulate his example. [i] Jessica L. Harland-Jacobs, Builders of Empire: Freemasons and British Imperialism, 1717-1927 (North Carolina: The University of North Carolina Press, 2007). [ii] “Key, William Shaffer,” Oklahoma Historical Society’s Encyclopedia of Oklahoma History and Culture, <http://digital.library.okstate.edu/encyclopedia/entries/k/ke014.html>, Accessed 31 October 2013. [iii] Muriel H. Wright, “William Shaffer Key: Oklahoma Patriot,” The Chronicles of Oklahoma 37 (1959): 138. [iv] Oklahoma Military Department, Historical Annual National Guard of the State of Oklahoma 1938 (Baton Rouge, Louisiana: Army and Navy Publishing Co., 1938), 23. [vi] Oklahoma Military Department, 23. [vii] Robert G. Davis, The Honored Men of Oklahoma Scottish Rite Masonry (Oklahoma: Oklahoma Lodge of Research, 1997), 55. [viii] Oklahoma Military Department, 23. [xii] Oklahoma Military Department, 23.